The Sacramento Oil Trains Coalition will hold a vigil on Wednesday, July 6, at 6 p.m. at the Florin Light Rail Station memorializing the 47 people killed in the oil train inferno in Canada known as the Lac-Mégantic Disaster three years ago. The Sacramento rally and vigil is one of more than 40 actions this week across the U.S. demanding plans to run these explosive trains through cities be halted. The vigil takes place in the capital of the third biggest oil state in the nation, where the Western States Petroleum Association (WSPA) is headquartered. WSPA, the oil industry trade association for the Western states, is the largest and most powerful corporate lobby in Sacramento. No bill opposed by the oil industry was able to pass through the legislature last year, due to the enormous influence that WSPA and Big Oil exert over the legislature and the Governor’s Office. I strongly urge you to stand up against the oil industry and for environmental justice by attending this event! Below is the press release with all of the details from the coalition. Please share widely. SACRAMENTO – Oil train activists Wednesday will charge that more than 13,000 students at 17 schools in Sacramento are within the blast zone of oil trains – like that one carrying Bakken Formation crude oil three years ago July 6 that killed 47 people in Canada and destroyed a town. 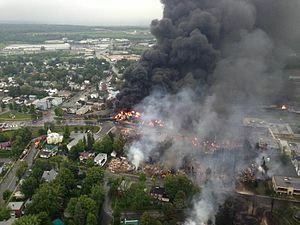 It's known as the Lac-Mégantic Disaster. A vigil memorializing those killed in Canada will be held tonight, Wednesday, July 6 at 6 p.m. at the Florin Light Rail station across the street from Luther Burbank High School, which is located next to the track leading to Kern County refineries. The Sacramento rally and vigil is one of more than 40 actions this week across the U.S. demanding plans to run these explosive trains through cities be halted. Locations of the actions are at stopoiltrains.org. Sponsored by Sacramento Oil Trains Coalition, including 350 Sacramento, ANSWER, Sac Activist School, and STAND, organizers said they want to "voice our protest" and demand plans to run oil trains through Sacramento stop before another tragedy destroys innocent people's lives. "We do not want these dangerous oil trains rolling through the communities of Sacramento, but that is exactly what the oil industry wants- to bring 100 car- long trains though our city, near our schools, home and businesses more than a day," said Chris Brown, action coordinator. Joining the vigil and protest Wednesday will be Ellen Cochrane, Sacramento City Unified School Board Member, and other special guests. Forty-seven people were killed when a 74-car train carrying Bakken Formation crude oil derailed, and destroyed a Canadian town three years ago on July 6. All but three of the 39 remaining downtown buildings are to be demolished due to petroleum contamination. Bakken crude, a fracked oil from South Dakota, is very volatile and derailments have led to massive explosions - more than 15 in the past two years, including one in the Columbia River Gorge at the beginning of June, said the coalition. "It is time we took the message of opposition out of downtown Sacramento, and into the disadvantaged communities, which, with backyards right next o the tracks, have some of the highest asthma rates in the region, from train engine fumes, and are now being subjected to this unjust risk," said Brown.